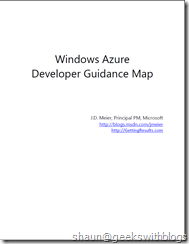 If you’re a Windows Azure developer or you want to learn Windows Azure, this map is for you. 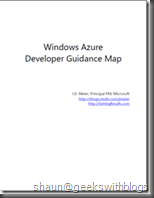 Microsoft has an extensive collection of developer guidance available in the form of Code Samples, How Tos, Videos, and Training. The challenge is -- how do you find all of the various content collections? … and part of that challenge is knowing *exactly* where to look. This is where the map comes in. It helps you find your way around the online jungle and gives you short-cuts to the treasure troves of available content. You can download the PDF directly here as well.